Senators Bassel Shanab and Emerson Carlson speak at an ASG meeting. Shanab introduced the campus-wide smoking referendum. Associated Student Government announced in an email Thursday that there will be a campus referendum on smoking tobacco cigarettes next week. The referendum will ask students if they would prefer more regulations and limitations on smoking in public areas, according to the email. 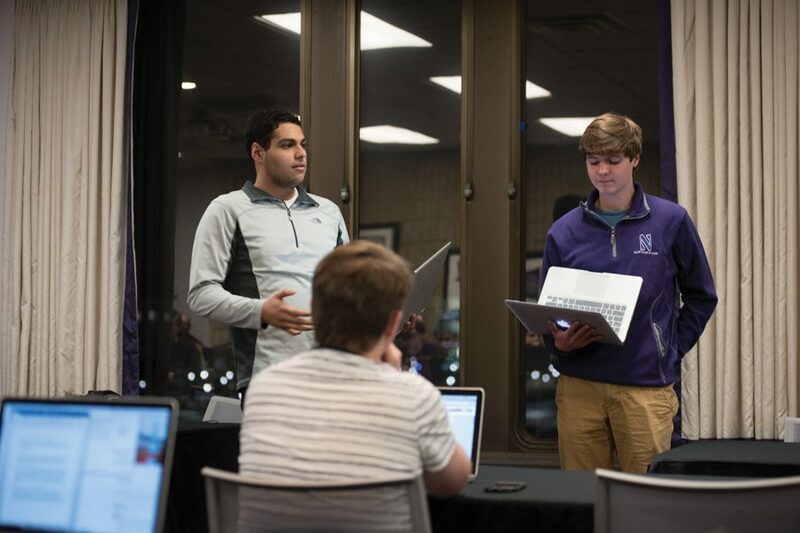 Weinberg freshman Bassel Shanab introduced the legislation for the referendum during a Senate meeting Feb. 21, though it was withdrawn the same day to add more specific details to the document. Shanab, an ASG senator, gathered approximately 200 signatures in support of the referendum, he said. Shanab said part of the reason he introduced the referendum was because Illinois passed the “Smoke-Free Campus Act” in 2014, banning smoking on all public college campuses. He added that Northwestern should follow its “sister campuses” in the legislation. University President Morton Schapiro, however, told The Daily on Thursday that it’s a more complicated issue than it may seem. The Evanston Clean Air Act, the current policy which applies to NU’s campus, prohibits smoking in public buildings, restaurants, parks, on public transit and other communal spaces. Smokers also cannot light up within 25 feet of the entrance of an enclosed area or a ventilation unit. ASG has tried to pass legislation in the past to make NU a tobacco-free campus in 2013, but it was rejected. They also attempted to pass similar legislation in 2015 after Illinois banned smoking on state universities’ campuses, but it was rejected as well. However, Shanab stressed that the referendum is only to see how students feel about smoking on campus and is not legislation to take any further action on a tobacco ban.